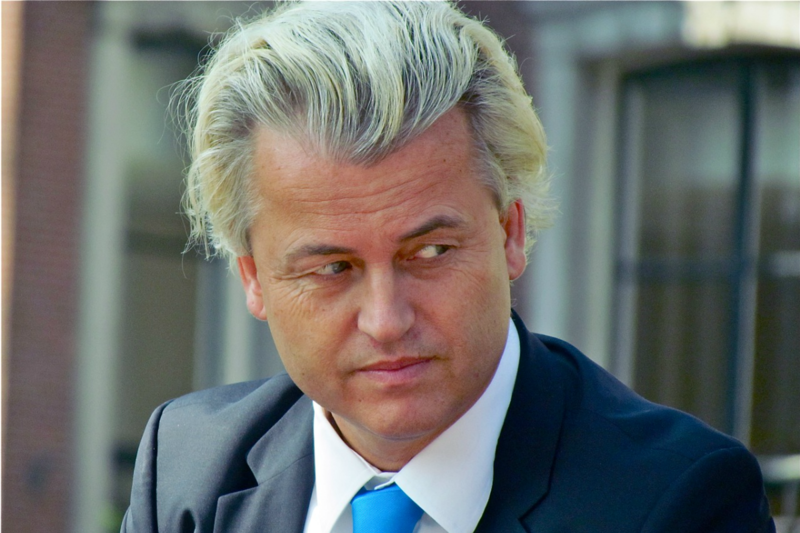 Geert Wilders’ populist Freedom Party (PVV) has suffered an electoral blow in The Netherlands’ EU elections, while the pro-European liberal party D66 is expected to claim the largest number of seats, according to an exit poll released on Thursday (22 May). The real winner may be abstention however. There was a suprising outcome after a day of voting for the European Parliament in The Netherlands: while the Dutch eurosceptic Geert Wilders dominated media and the public debate throughout the campaign, it now looks like his PVV party has lost two seats in the next EU Parliament. “From five to three seats; it is quiet at the PVV,” tweeted NOS’s political journalist Michiel Breedveld yesterday evening. While the far-right party made losses, the left-liberal D66 and the centre-right CDA claimed victory. These two parties are neck-and-neck for the first spot, coming out at 15.6% and 15.2% of votes respectively. The outcome is based on provisional results of an exit poll conducted by the pollster Ipsos. Final results will be published after polling stations in all European countries close on Sunday evening. Ruling parties in the Dutch government managed to stand their ground, the polls suggest. While the socialist PvdA dropped by 2.6 percentage points, it is set to keep its three seats in the EU Parliament. The centre-right liberal VVD gains 1.1 points but remains at three seats as well. There were also a few surprises. The Netherlands has no electoral threshold, which has put smaller parties on the map. The two newcomers amongst the Dutch parties in the EU Parliament, are the Party for the Animals (PvdD), focusing on animal welfare and ecological issues, and the 50PLUS party, targeting seniors. Both end up with one seat. But people surveyed by broadcasters throughout the day showed a gloomier picture of voter interest. The key challenge at European elections is still getting people to the voting booth: “I just don’t know what to vote,” several of the respondents reacted. The overall turnout in The Netherlands remained stable at a dramatically low level. 37% of voters showed up for yesterday vote; 36% did so in the previous EU elections in 2009. Key issues in the campaign running up to these elections were the economic woes of the single currency, and The Netherlands’ membership of the EU. But populist figurehead Geert Wilders failed to convince the undecided voters, polls show. Managing director of transparency organisation VoteWatch and former Dutch MEP, Michiel van Hulten, argued the poll does reflects a broader change of mind in The Netherlands. “The media might have misjudged the anti-European sentiment. The economy in The Netherlands has also picked up some pace, which could have convinced voters to stand by the EU,” van Hulten told EURACTIV. But Simon Rooze, who tracked the Dutch elections for the PR agency FleishmanHillard, reacted more cautiously. “Turnout was very low and so those feeling negatively about the EU presumably weren’t motivated to cast their ballot,” he told EURACTIV. The Netherlands, together with the United Kingdom, were the first to open the polling stations for the 2014 EU elections. Contrary to other member states, media reported on the exit polls. Apart from the NOS results, other small-scale polls showed similar outcomes. Results in the UK, which held its elections on Thursday as well, are unknown until Sunday night. The European Commission said yesterday that the publication of exit polls posed no problem, but warned against announcing official results until 23.00pm on Sunday. Putting out such exit polls is a risk, the Dutch experience shows. In the local elections, last March, media reported distorted figures that showed a record loss for the CDA party but appeared untruthful in the final result. A citizen initiative organised by the populist news website GeenStijl.nl also called on Dutch citizens to head out to the polling stations and demand the results from the presidents of these stations, a method justified by Dutch electoral law. Another reason for caution is that such partial results could influence voters in other EU member states. So does this form a prelude for the EU elections being held in other member states in the coming days? Liberal candidate to become EU Commission president, Guy Verhofstadt, said in a statement: “This upset announced regarding the Dutch populists is a scathing rebuttal to all those who claim that results are a given in advance of this crucial election. All polls predicted that Geert Wilders, the ally of Marine Le Pen and his friend Nigel Farage, would come in first. Finally, he is fourth behind D66 and VVD who are seated with the ALDE Group in the European Parliament." "The Dutch rejected the Constitutional Treaty by referendum in 2005. Since then they have been plagued by doubts about the European project and subjected to rowdy nationalist and xenophobic propaganda. At the end of the campaign, and after reflection, the Dutch have drawn the conclusion: the European Union means strength, and extreme nationalism is a danger." The leader of the far-left Socialist Party (SP), Emile Roemer, said: “We are now the largest party on the left. It is our biggest electoral victory ever in Europe. If this is final on Sunday, we are very happy.” The far-left SP overtook the social-democrat government party PvdA by 0.6% in the exit poll. The Netherlands organised its European Parliament elections on 20 May, as one of two first countries to open the polling stations. Dutch voters elected 26 MEPs. The country is a eurozone member and has faced increasing pressures from anti-European, populist political forces over the past decade. The opposition to EU integration and the country’s EU membership is carried by populist Geert Wilders. Mainstream parties have been forced to speak out on EU issues all the more, and many have taken a critical stance on it. In 20 May’s vote, the D66 party, a member of the ALDE faction in the EU Parliament, also won seats by taking a strong pro-European stance.